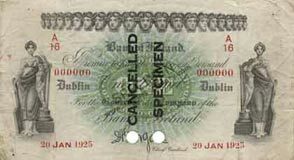 The Bank of Ireland’s series of 1922 was arguably the first modern Irish banknote series. 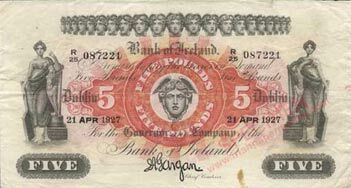 It was the first major change of the bank’s core banknote design since 1838, and the first time that banknotes of Bank of Ireland were printed on both sides. 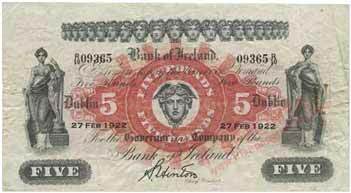 This series was also to be the last all Ireland issue of the bank. The development and initial issues of the new Series H resulted in several very rare banknotes early in the series. There are two signature variations for Series H banknotes, giving two basic Types: A and B, defined by signature: S. Hinton (TypeA, 1922-1923), and J. A. Gargan (Type B, 1923-1928). These two Types divide into four distinct variations of £1 notes and £5 notes, two for each Type; and three recorded distinct variations of £10 notes, as listed below. New design. Small sized modern banknotes printed on both sides. Head Office DUBLIN. Banknote sizes increase with denomination. £20, £50, £100 notes are of uniform size. Banknote sizes vary within a denomination by a few millimeters. 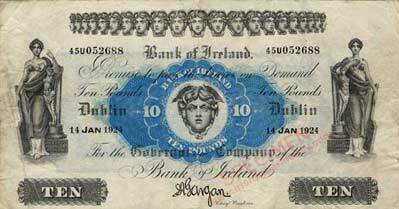 All notes bear the water mark “Bank of Ireland”. Two Types by signature: Type A, signature: S. Hinton; Type B, signature: J. A. Gargan. A1: initial printage, date in copperplate typeface. A2, B1, B2: month in sans-serif typeface, with day and year in serif typeface. Black serial numbers and dates on all Types except £1 notes of Type B2, where prefix and serial number are changed to red. Six digit serial numbers on all varieties. Prefix number serif, letter sans-serif on all varieties. £1 notes. Linear prefix. Non-abbreviated date APRIL in copperplate typeface. 1 Date. 10.4.22. £5 notes. Signature: S. Hinton. Date in copperplate typeface. Old style (taken from Series G £1 notes) 5 digit serial number with fractional semi-serif prefix on left and suffix on right. 2 Dates seen. 27.2.22, 10.3.22. £1 notes. Months of more than 4 letters abbreviated in sans-serif type with serif numerals. 5 Dates. 1922. £5 notes. Linear prefix, number serif, letter sans-serif. 2 Dates seen. 15.3.22; 16.3.22. £10 notes. Linear prefix, number serif, letter sans-serif. 1 Date. 10.1.23. £20. SPECIMEN 31.2.22. Linear prefix P, plus six digit serial number. No issued notes known. £1 notes. Linear prefix. One Pound added in centre of note. Proof without date. 1 Date. 19.3.24. £5 notes. Linear prefix, number serif, letter sans-serif. 4 Dates. 1923-1924. £10 notes. Linear prefix, number serif, letter sans-serif. 1 Date. 14.1.24. £1 notes. Red serial numbers, Fractional prefix. 8 Dates. 1925-1928. £5 notes. Fractional prefix, number copperplate typeface, letter sans-serif. 8 Dates. 1925-1928. £10 notes. Fractional prefix, number and letter copperplate typeface. 1 Date. 10.10.25. BH1. 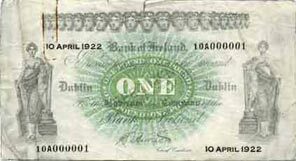 £1 notes [1922-1928] Prefix starts anew at 10A. 150 x 85 mm approx. BH2. £5 notes [1922-1928] Prefix starts anew at R/10. 175 x 95 mm approx. BH3. £10 notes [1923-1925] Prefix U continues from Series G. 195 x 105 mm approx. BH4. £20 notes  Specimen Prefix P only. 205 x 108 mm approx. BH5. £50 notes  SPECIMEN No issued notes known. 205 x 108 mm approx. BH6. £100 notes  SPECIMEN No issued notes known. 205 x 108 mm approx. Almost all the dates have been recorded for Series H: £1 Notes, 14 dates; £5 Notes, 18 dates; £10 Notes, 3 dates. There are three £5 note dates that have not yet been recorded. It is likely that all of the other issued notes have been recorded. Examples of all the recorded dates for Series H can be viewed in the Series H date listing 1922-1928.